Favourite books I found at VPL today. The public library is a perfect place to hide out with one (frozen) child while the other plays soccer (in this snow!!? Only in Vancouver!) What did we find? 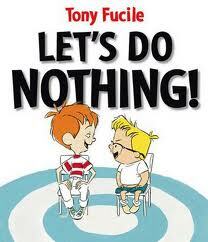 Animator Tony Fucile’s first picture book Let’s Do Nothing has a very alluring title. Nothing? Ah, such a comforting idea after a busy, busy week. Frankie and Sal are two bored boys. What to do? How about nothing? Great idea! They each sit in a chair committed to exactly that – the act of doing nothing. But, how possible is it? I read this to my son who hooted at Frankie’s hopeless attempts at doing nothing as his overactive imagination always caused him to do something. (There’s a part about a tree and a dog with a raised leg . . . that was absolutely hilarious to him) Can’t wait to try this book out on my class. Will they think it is impossible to do nothing? We practice mindful breathing three times a day. Is breathing something or does it count as nothing? This will be an interesting conversation . 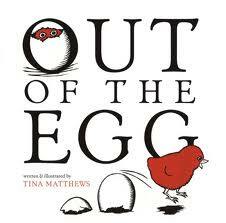 . .
Tina Matthews is the author and illustrator of Out of the Egg, the Little Red Hen story – reinvented. We still have all of our “Not I” animals, too busy being lazy to help out. But in this story our Little Red Hen not only plants and nurtures a beautiful shade giving tree, she also has a lovely little chick hatched out of a perfect white egg. Out of the egg hatched a little red chick. 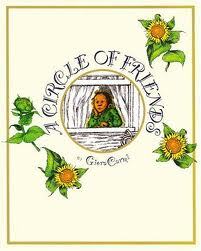 Giora Carmi made a beautiful book – A Circle of Friends – all the more powerful in its simplicity because it is wordless. 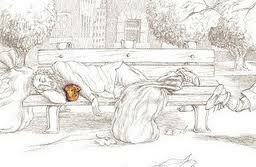 A little boy shares his snack with a homeless man sleeping on a park bench. The man sprinkles crumbs on the bench for the birds nesting in the tree above him. In the end, the little baby bird drops a seed in the window box of the boy. And soon, a beautiful sunflower grows. Each page is sketched in black and white with one highlight of colour. All about the circle of kindness inspired from one gesture. My daughter commented, “Mama, this is also a what comes around, goes around book, but in a nice way.” Absolutely! This entry was posted in Picture Book Love and tagged asking questions, bird books, Giora Carmi, great read alouds, homelessness, library books, MindUp, philosophical discussion, picture books, Tina Matthews, Tony Fucile, wordless by carriegelson. Bookmark the permalink.